In an earlier blog post, I introduced the weird story of the Hexham Heads, rather strange little objects with prehistoric pretensions found in a very (sub)urban context in Hexham, County Durham. The story of the initial discovery, the ‘poltergeist’ activities that seem to have accompanied the little stone heads, and claims and counterclaims about their age and origin provide an already rich folk narrative. But fairly soon after two children found the stones in their garden in Rede Avenue, these objects came into the orbit of archaeologists, historians, pseudo-scientists and psychics. They travelled the length of England as an answer was sought for the nature and date of these objects. The Heads were tested and became even more contested – specialists disagreed, amateurs speculated, and then finally the Heads were lost. These enigmatic items of mobile urban prehistoric material culture were in the end too mobile, and their current whereabouts remains a mystery. Of course the Heads were quickly, after their discovery, passed onto the ‘authorities’. They were held for a while in the Newcastle Museum of Antiquities, where they were formally drawn to scale in a conventional archaeological style, and thus became proper archaeological artefacts. Archaeologists and curators, such as Roger Miket and David Smith, who handled or knew of the Heads were non-committal about what these strange objects actually were. The remarkable tale of the objects, and the associated ‘curse’ made little impact on these seasoned professionals (if they even knew about these stories at all). In Paul Screeton’s 2010 book Quest for the Hexham Heads Miket described them as ‘just archaeological material’ which is a bit like describing the Turin Shroud as ‘just a blanket’. But others were less circumspect, and before the bombshell was dropped by local man Des Craigie that he claimed to have made them as playthings for his children in the 1950s, another academic had grasped the Heads very enthusiastically, and situated them within a Romano-Celtic head cult tradition. Inevitably, by doing this she brought upon herself a visitation from a werewolf, mirroring to an extent earlier events in Rede Avenue. This academic was the recently deceased Dr Anne Ross, a well-known Celtic scholar whose interests straddled the worlds of archaeology, history, and art history, with a bit of dabbling in folklore and Celtic mysticism thrown in. Her best-known and quite well respected publications hint at her proclivities: The Pagan Celts and Pagan Celtic Britain have both run to multiple editions. 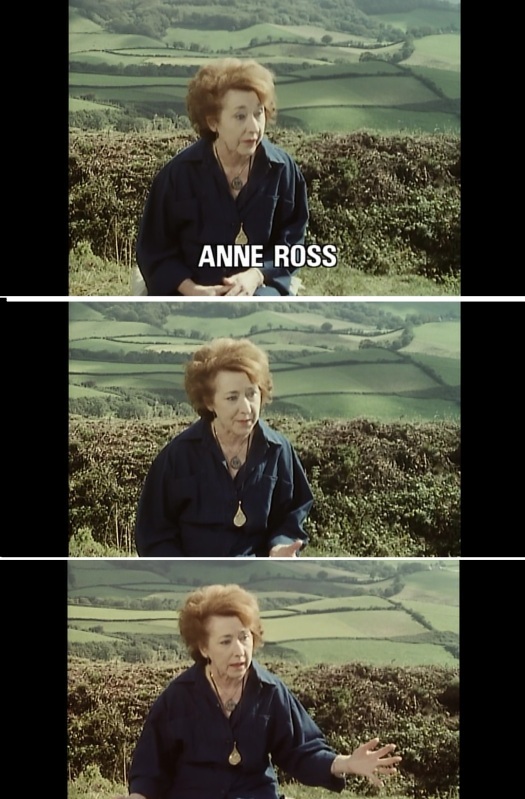 It would be fair to say that Anne Ross has a somewhat ambiguous reputation amongst early medieval archaeologists, a nice person but with some strange side interests. 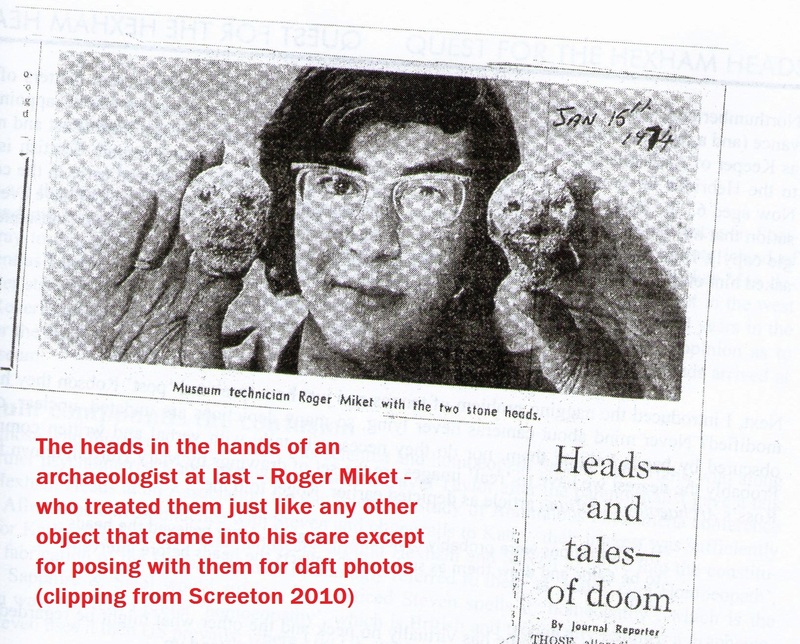 She became involved in the Hexham Heads saga when she was passed photos and drawings of the Heads by Roger Miket. She visited Newcastle to give a lecture, and Paul Screeton has suggested she courted publicity for her rather boring sounding lecture by informing the media she would be looking at the Heads and speaking to Mrs Dodds (neighbour of the boys who found the Heads in 1972) about her ‘were-sheep experience’. The Heads and the weird stuff that accompanied their discovery was of great interest to Ross, as she came to believe that they were Celtic objects, perhaps cursed, and that the garden of 3 Rede Avenue where they were found was once a Celtic shrine. She even contemplated excavating the garden although never got round to it. It was not surprising that Anne Ross showed an interest in these strange little objects. 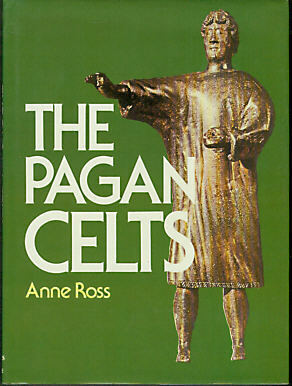 She had long had a research interest in ‘the cult of the head’ across Celtic Europe, writing in 1967 that ‘the human head was regarded by the Celts as being symbolic of divinity and otherworld powers’ (Pagan Celtic Britain page 61). And there is precedent for ‘Celtic heads’ to be found in back gardens. 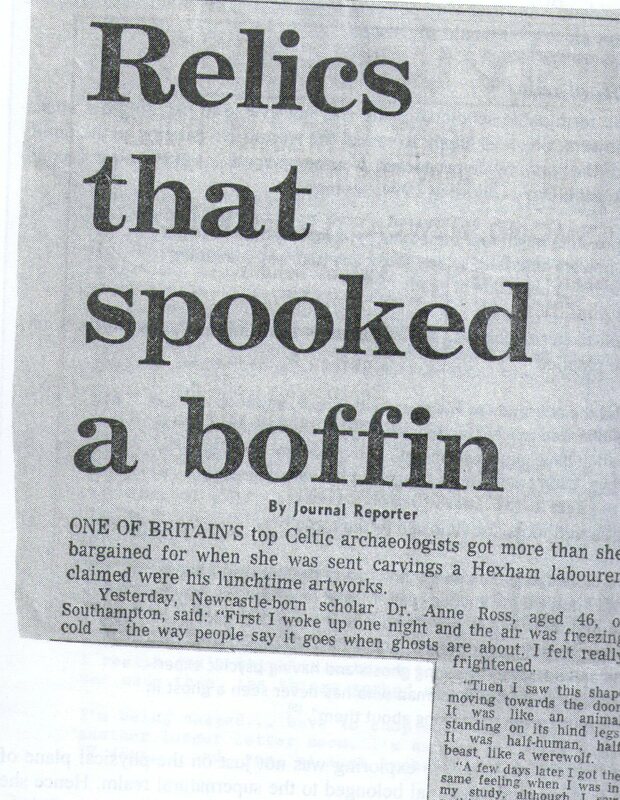 An (undated) newspaper clipping from the Daily Telegraph that I found contained in a copy of Pagan Celtic Britain held within the Leslie Alcock Library, University of Glasgow, discussed a ‘concentration’ of carved stone heads that had been found in Yorkshire. The Telegraph archaeology correspondent FW Perfect (a fine name) noted that their ‘existence became known when several people who had dug up heads in gardens and allotments brought them’ to a museum in Bradford. These were ‘crude, almost caricatures of human faces’, some ‘grotesque’ and Anne Ross thought it possible some were Celtic in part because of their ‘Heavy moustaches’. 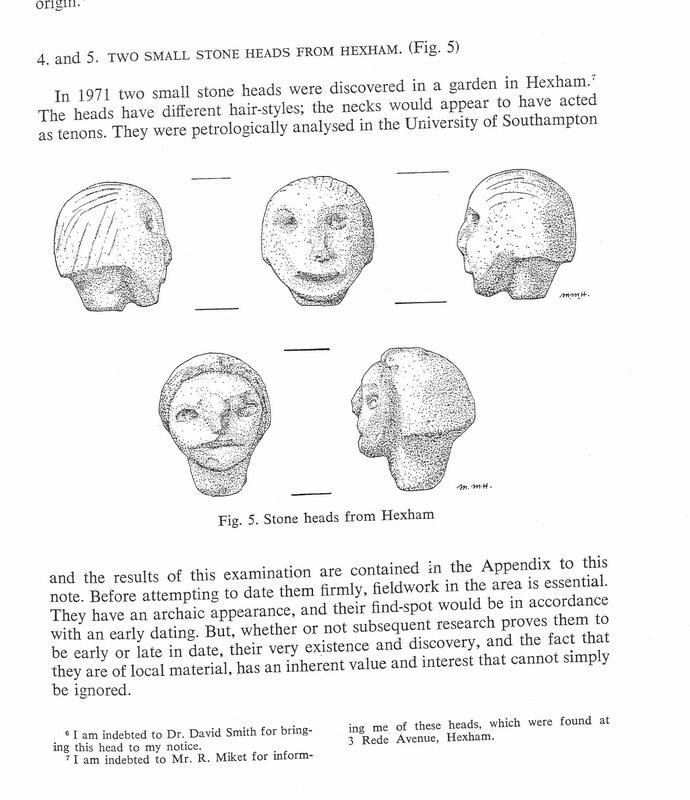 And so she quickly published the Heads, in 5th series volume I (1973) of the journal Archaeologia Aeliana, as part of an article entitled ‘Some new thoughts on old heads’. The article rounds up various recently discovered stone heads from the Hadrian’s Wall vicinity, all of which lay claim to being Romano-British. The heads were illustrated (reproduced at the top of this post) and described as ‘Two small stone heads from Hexham’. It is a rather strange account: she notes their ‘archaic appearance’ (which amounts to nothing in terms of dating evidence) and suggests ‘their find-spot would be in accordance with an early date’. Eh? They were found in a back garden! The article includes, as a footnote, the results of visual and petrological analysis on the wee Heads undertaken by Prof Frank Hodson at Southampton University. He identified the material the Heads were made from as sandstone, with hints of a lime coating and some applied colour pigments. It is quite remarkable that two such disputed and strange objects appeared in an academic journal, but there was some science to back it up (albeit superficial and not related to dating). Ross tried to give the Heads an archaeological credibility by including them in an article with other ‘heads’ with a better provenance and stronger claims to be authentic. The format of the publication adds to this impression: the Heads were drawn to correct conventions and standards, petrological analysis had been applied, and they were placed into a historical context of sorts. Difficulties in dating and lack of context were acknowledged. But there are also clear problems with this account: her insistence on the urban findspot being important had no physical evidence to back it up. The geological analysis seems to have been problematic. And events would soon overtake this dry academic account as Anne Ross was dragged deeper into the mythos of the Heads. On the rather bizarre platform of the BBC TV early evening news magazine Nationwide, Anne Ross made some amazing claims about the Hexham Heads that were not fit for academic publication. She recounted that her home in Southampton was being haunted by a huge werewolf that seemed to have followed the Heads all the way from the NE of England; the Heads had been brought south with Ross for analysis at her own institution, Southampton University, and she had taken them home. Big mistake! The Heads were now gathering (literally) a nationwide reputation for being too hot to handle and seriously spooky wee things. Yet the tests and analysis continued. And this is where perhaps the strangest aspect of this whole story emerges – how is it possible that two specialists (geologists no less) were able to look at these objects and come to completely different conclusions about the materials they were made from? 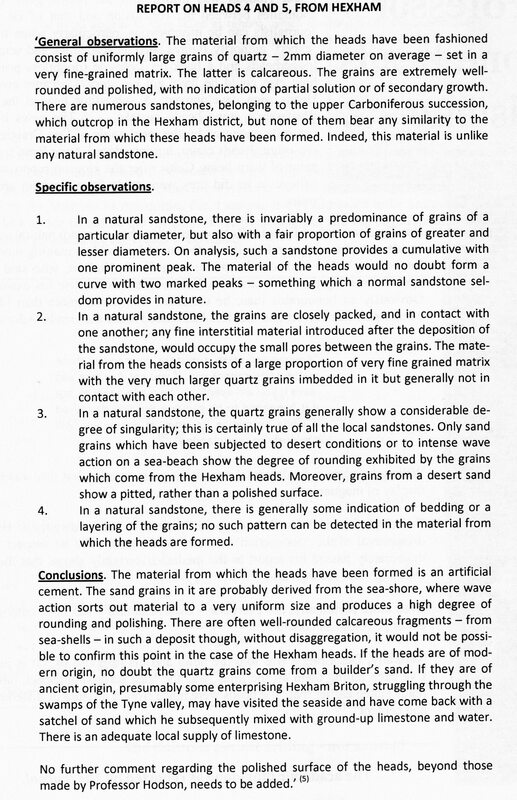 Remember, Anne Ross had got Professor Hodson at Southampton University to look at them and he concluded ‘both heads are made from the same material….a very coarse sandstone with rounded quartz grains’ and he suggested local sources for this. But a second analysis came up with a very different conclusion. Undertaken by Dr Douglas Robson of Newcastle University (his report is reproduced below, and published in Screeton’s book), it concluded ‘the material from which the heads have been formed is an artificial cement’ and ‘the material is unlike any natural sandstone’. The former and earlier analysis seems to have been based on microscope work and limited visual analysis, while the latter appears to have been based on the invasive removal of a sample for analysis. It is difficult to see how two analyses of the same objects could lead to two such divergent identifications of the material involved, and it is a pity the sample fragments no longer appear to exist, as these could now be tested much more definitively (and without doing further damage to the materials). Archaeologists and geologists spent quite some time poking and prodding the Heads, taking chunks from the objects and each other. There was a good deal of dispute as to whether they were genuinely ancient or modern fabrications (with most opinion tending towards the latter). And there was the small matter of apparent poltergeist activity and a curse following the little Heads around. And then yet more specialists became part of the story. 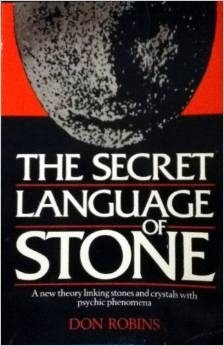 In 1977, the Heads passed into the care of Don Robins, a controversial chemist whose most famous work is probably the book The Secret Language of Stone (in part about the Heads) and who dabbled in a range of ‘earth mysteries’ related to things like the magnetic properties of stones and megaliths. 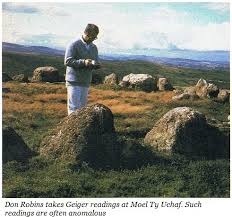 He also collaborated with Anne Ross on their book The Life and Death of a Druid Prince about the Lindow Man bog body. He became convinced that the Hexham Heads could help prove his stone-tape theory (that stone could ‘record’ events and human emotions and then could play them back) and he rescued them from a box in Hodson’s office at Southampton University. He kept the Heads for some analysis until early 1978 during which time his dog got excited and bit one of the Heads. Robins recounts various rather weak experiences he had that might have been connected to the female Head such as his car electrics dying. Once he thought this Head’s eyeballs were watching him. But he seems to have been unable to connect the objects with the poltergeist activity, and then he passed them onto the final character in the story, a ‘dowser’ called Frank Hyde. The elusive Hyde was delivered the Heads in February 1978 to do some ‘dowsing experiments’ with them – and they have never been seen since. The story of the Hexham Heads is a remarkable one. These supposedly prehistoric objects found in suburban Hexham spent the six years after their discovery collecting around them, like a magnet, a collection of strange and interesting people. They were passed around like hot potatoes, leaving behind them confusion, disillusionment, fear and tension. They were treated like archaeological objects, but also treated as if they were worthless fakes. Then they disappeared. As Robins noted in The Secret Language of Stone Frank Hyde ‘seemed to have vanished as completely as if he had walked into a fairy hill in a folk tale’. I have one more post to write on the Hexham Heads, the tale of my own pilgrimage to Hexham and the urban street where these objects were once found…. Sources and acknowledgements: the definitive account of the discovery and journey of the Heads, and the search from them since 1978, is Paul Screeton’s 2010 book Quest for the Hexham Heads which I recommend. From this I sourced several of the images in this post, including newsclippings and the Robson report. A lot of the information in this post comes from this source, along with two articles published in The Fortean Times 294 and 295 (November / December 2012) written by Stuart Ferrol. Plus I also consulted The Unexplained File: Incredible phenomena. The image of Don Robins came from the Dragon Project website (which was a bit unstable when I visited it), and the drawings of the Heads came from Anne Ross’s Archaeologia Aeliana article (1973). The Anne Ross pics came from an obituary, while the Nationwide logo was sourced from Wikipedia. What an intriguing story! Cant wait for the next instalment!